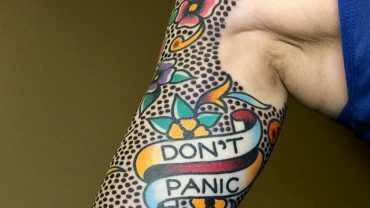 Many people are still baffled with the idea of drawing a tattoo on the skin. They simply prefer clear skin because it looks more appealing. Well, people can say whatever they want about tattoos, but you have every right to express yourself with this art. There is a popular belief that tattoos should never be worn by women because they are the epitome of masculinity. This doesn’t sound right at all. Although people who have tattoo are still judged, none should feel limited if they want to have a tattoo. If you’re a woman, it’s important to feel empowered because a tattoo can display a different side of you. There is no need to conform to society because tattoos apart from being art are also used to show passion and freedom. Is it possible to make a tattoo look more feminine? Absolutely, there are things you can do to tone down its appearance. For example, you can opt for a design that’s heavily linked to women and femininity, such as roses, cats, feathers, etc. Picking certain colors like pink and pastels will also help because some colors are loved by females. And then, go for the right size. A small tattoo looks less obtrusive, thus, it won’t look too all in your face. This can help soften its image. A tattoo typically carries a meaning. Even if you randomly pick a design, it’s likely that the design holds an important message. This applies to feminine feather tattoos. You may have no idea how a feather tattoo could be seen as meaningful, but the truth is this particular object symbolizes beauty and elegance. This is one of the reasons why these tattoos look great on women because they’re all about grace and elegance. Remember that bird feathers come in various colors and shapes. We all have a preconceived idea of what a feather is supposed to look like, but when you pay close attention, each species actually has its unique feather. Eagle feathers, for example, they symbolize great power and bravery. So if you think they represent you in some way, it’s a good idea to have a tattoo with this design. Meanwhile, owl feathers with all the velvetiness depict wisdom and intellect. For those who consider themselves to be wise like an owl, getting this tattoo is a way to go. There are many other types of feathers with their own unique meanings. You can look up for more information online or from other sources. After that, go to a tattoo artist to apply the design.